I came rather late to satnav/GPS, having had my first one now for less than 2 years. However, I am a complete convert and cannot imagine doing without mine. Not only is it invaluable for recording significant locations, like museums and collections I've visited and want to revisit or tell other people about, but it has turned out to be really useful day to day, just for visiting relatives, travelling on business, and so on. I even take it with me when I fly abroad so that I can install it in hire cars. In fact, I have used it a number of times abroad when travelling by taxi - when it has become clear that the taxi driver does not really know where he is going I have been known to dig it out from my bag, install it on his dashboard - and get there sooner (and probably at a lower taxi fare). Personally I am very taken with the NavPix feature, where if you have a satnav with a built-in camera you can just take a photograph with it to record a location. 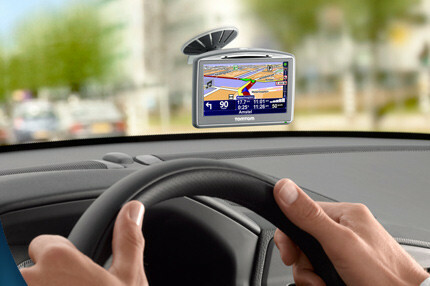 I find that extremely useful, so my satnav holds photographs of my home, office, relatives' houses, etc. For example, when I recently visited my brother in the middle of the countryside I had some difficulty getting there, even using the satnav, so once I was there I just took a picture of his house (you can do it very conveniently just through the windscreen of the car while the satnav is still on the dashboard). Now I can navigate there again, even if I cannot remember his address, simply by scrolling through the NavPix images and selecting the one of his house. 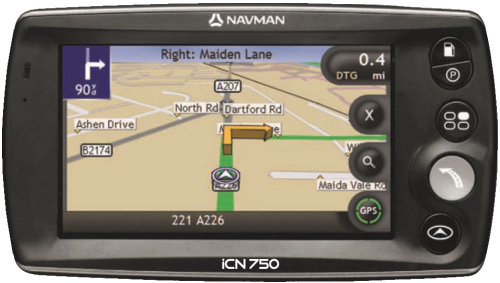 I am currently using a Navman ICN 750. 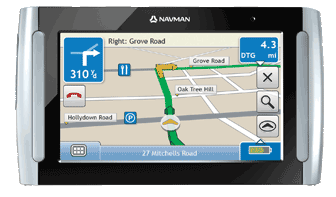 This satnav is one with a built-in camera and I have used to it create many NavPix images. Screen Size: The bigger the screen the better. When you're driving you need to be able to see the map and its icons as clearly as possible. Maps: Check what maps it comes with, and if you think you'll need other maps later then check now to see how much they will cost (it may be cheaper to go for the next model up if it includes all the maps you need). Memory Size: The bigger the memory the better, particularly if it does not come with all the maps you need. If you install maps later and the memory is small you may find that you need to uninstall one set of maps to use another. That's a particular problem if you regularly fly abroad on business, and when you do you find you don't have available the maps you need. Size and Weight: Look out for the smallest and lightest unit you can find, so long as it satisfies the other criteria. Reflectivity: This is perhaps not an obvious issue, but the most annoying thing about my satnav is that it has a highly reflective plain glass screen. This means that a lot of the time when driving on a sunny day, or when the sun is low, I am squinting to make out what is on the screen. Camera: This is a personal thing just to think about - I like NavPix and find it very useful, and easy to navigate with, but you might just feel it's a bit of a gimmick. While being it is a 'previous generation model, as indicated by its relatively large size and significant weight. A current equivalent model would be something like a Navman S90i (though without experience of that model this should not be considered an endorsement). Of course if you're not particularly keen on the integrated camera - and it's certainly not essential - then there's a huge range of models available. The five most popular brands are TomTom, Navman, Magellan, Garmin and Mio, and they each have a number of different models.